Copyright means "the right to copy". It is the legal right of the author to make copies of and use his/her work. Before 1989, the author had to give notice under US laws with the letter C to exercise his/her copyright on his/her work. In 1989, the US laws were revised to make copyrights automatically applied to all work of creation. This made ownership of the copyrights easy but sharing difficult as users would need to seek specific permission from the authors to use their work. To solve the problem, a non-profit organization called the Creative Commons (CC) was formed in 2001 to issue free copyright licences specifying the conditions under which the author would allow public use of his/her work. Match the words on the right with explanations on the left. Someone holds/owns the copyright of a piece of work. e.g., The author holds/owns the copyright of his book. Something is protected by copyright. e.g., This product is protected by copyright. e.g., If you copy the design of a product in producing your own, you will breach/infringe the copyright of that product’s owner. e.g., You can’t use these copyright materials without seeking approval from the owner first. The basic meaning of “trespass” is to go into a piece of land or property owned by another person without asking for permission. For example, “You are trespassing on this private property!’’. In usage, the word can either take an object like “this private property” in the example above or used alone, .e.g., “You are trespassing!”. Can you watch the video again and find out the usage of ‘copyright” and “trespass/trespassing” in it? Narrator: These are Jack and Meg White, also known as The White Stripes. They are a band form Detroit. They make Rock and roll without a bass guitarist. This is Steve MacDonald, of the veteran band Red Cross. Steve thought the White Stripe could use a bass player, so he appointed himself. He took The White Stripe album called “White Blood Cells” and re-recorded it, laying a bass track down on every song. Then he released the results as mp3s on Red Cross’s website. He even made up a new album cover and title – “Redd Blood Cells”. MacDonald again put these copyrighted songs online without permission from The White Stripes or their record label. During the project, he bumped into Jack White who gave him spoken assent to continue. It can be that easy when you skip the intermediaries. Collaboration across space and time. Creative co-authorship with people you’ve never met. Standing on the shoulders of your peers. It’s what the internet is all about. It can be that easy when you skip the intermediaries. But couldn’t it be easier still? Not many of us are liable just to bump into Jack White and get the green light. And he’s not gonna let just anyone play the bass over his songs in any case. But what about other artists who might want you and me to play along? Shouldn’t we be able to if they don’t mind? Enter one of the internet’s most famous citizens, a phrase familiar the world over, a public identity rivaled only by a handful of corporate giants and superstars - the big copyright C. Everyone knows what big C stands for. Big C means “all right reserved”. Big C means “ask permission”. Big C protects copyright owners and notifies the rest of us of their ownership. Time was when you had to get big C on anything you want to be copyright, or else it ended up in the public domain, the commons of information where nothing is owned and all is permitted. You had to put the word on notice to warn them. That was big C’s job. And it was a useful one. What changed? The law! By the late 1980s’, US law had changed so that works become copyrighted automatically the moment they’re made. The moment you hit “save” in that research paper. The second the shot is snapped closed. The instant you leave your name on that cocktail napkin doodle, your creation is copyrighted whether the big C makes cameo or not. So suddenly there’s no quick way of knowing whether something is owned or not. The new rules may be clear about how you get to own a work - you don’t have to do anything. But they say nothing at all about how you should go about announcing that you want to allow certain users of your work. So what? Well, if you are a digital filmmaker whose every frame must be cleared by an army of lawyers before making a cut, or if you are in a band whose label won’t let you put a song on a file-sharing network, or if you are a professor trying to put together online course materials, or if you are a DJ chasing down permission to use every snippet of song in your sonic collage. If you are one of these people, then you know so what! “We interrupt this brainstorm to call the lawyers!” You drop what you’re doing and call all the lawyers. You ask for permission. Even if you use a work the author doesn’t mind if you use it. Because you have no idea what the author’s intent is. You ask for permission even to share some of your rights, or you venture forward unsure what your rights and risks are exactly, or in a haze of legal doubt, you do nothing. Bottom line – the big C is out of the job, the middlemen are not. Enter creative commons. 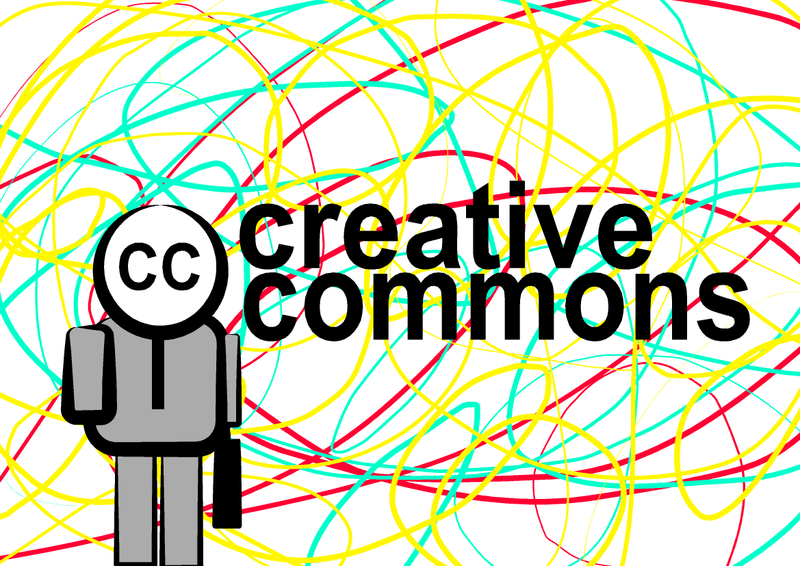 Creative commons wanted to find an easy way to help people tell the world upfront that they want to allow some uses of their work. We called the experts - the US Copyright Office - for advice. Their response? “There’s no real answer. Get creative!” So we got creative! How? Our “cc” brand mark works for the government by creative commons licenses. A set of standardized copyright licenses available free of charge on our website. We wrote these licenses so that lawyers and courts can read them. Then we translate them into a language that you can read. And then we translate them into a language that computers can read. Now “cc” isn’t meant to compete with copyright but to complement it. It allows you to retain your copyright while granting the world permission to make certain uses of it upon certain conditions. If the “big C” is like a red light, then “cc” is the green light. If the “big C” says, “No trespassing”, the double c says, “please come in”. If the “big C” says, “All rights reserved”, “cc” says, “Some rights reserved”. So you can use the powers of the net to find works free to share and build upon, and to invite other people to transform or trade with yours, so that you can get creative, not only with what you make, but how you make it available, so you can collaborate across space and time, so you can be a co-author with someone that you’ve never met, so you can stand on the shoulder of your peers. All without asking permission, because permission has already been granted. Creative Commons. Get creative. It’s easy when you skip the intermediaries.